In life, love, and beauty it appears we’re told a lot of lies. From how long a lipstick will actually last to how many times we should be brushing our hair at night, we’re not sure who is telling the truth anymore. Since our time is precious, and we don’t want to waste it worrying about things that aren’t actually true, it’s time to get down to the actual facts behind these “myths” that we’ve heard. Here are some beauty lies to never, ever believe – and let us know if you have more that you want answered in the comments below! For shiny hair, brush your hair 100 strokes with a brush each night before bed. LIES: RIP! Your hair is actually dead. 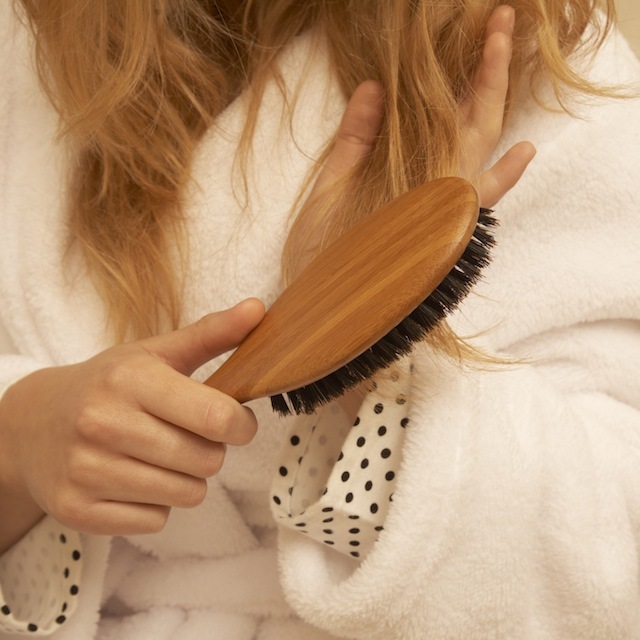 Brushing that much can actually strip the natural oils, break brittle hair and increase static electricity. Oops. Let it rest in peace and it’ll treat you a lot better. LIES: We don’t understand this myth, but have been hearing it forever. “Sleeping can be hard enough without forcing yourself to sleep in certain positions. Actually, getting good sleep keeps you healthy and that may just prevent wrinkles. It’s during sleep that our body rids itself of toxins, repairs damaged cells, and preserves healthy function. Beauty sleep is not a myth,” says Dr. Jessica Krant, MD, MPH, is a board-certified dermatologist, Assistant Clinical Professor of Dermatology at SUNY Downstate, and Founder of Art of Dermatology on Fifth Avenue in New York City. Once you’ve over-plucked your eyebrows you could never regrow them because you’ve done too much damage to the follicles. LIES: This is just not true, and if you really think about it you have hundreds of hair follicles in the brow area that still remain quite capable of producing new hairs if you treat them right. Drinking water will hydrate your skin. LIES: Only applies in extreme cases of dehydration. “Otherwise, drinking water no more hydrates your skin than taking a bath quenches your thirst. The bodies separation between the inside and outside of your skin is just too darn good,” says Cynthia Bailey, M.D., a Board Certified Dermatologist, President and CEO, Advanced Skin Care and Dermatology Physicians. Shaving hair will cause it to grow back thicker. LIES: Shaving does not change the caliber of the hair, sorry, but it’s true. Sadly, age does. Yes, those frisky whiskers do become thicker and more robust with age. Also, shaving sharpens the ends so they feel more frisky in just a few days as the shaved hairs start to grow out. For additional SPF protection, layer different products containing sunscreen. LIES: Sunscreens are carefully formulated and tested to achieve the level of protection indicated on the bottle. “Using a moisturizer with SPF 15 and a BB cream with SPF 15 does NOT give you an SPF 30. The level of sunscreen chemicals doesn’t increase the same by doubling the amount. The best bet is to find products that contain your desired level of production,” says David Pollock, chemist and beauty industry expert, author of Just Stop the Lies: Secrets the Beauty Industry Doesn’t Want You to Know. As we age, collagen levels decrease. Collagen creams can help replenish collagen and firm the skin. LIES: Once we hit the age of 25, our collagen levels deplete at the rate of 1.5% each year. By the time a woman reaches menopause, 45% of collagen is lost. Collagen is a naturally-occurring, large molecule protein that supports and firms the skin, but can not be absorbed through the skin’s surface. “The best bet is to avoid outside factors that accelerate the loss of collagen, such as over-exposure to the sun, smoking, stress and pollution. Also, use products that contain ingredients to promote collagen production, such as Vitamin C or some of the new peptides on the market. And incorporate foods that can promote collagen in to your diet, such as eggs, yogurt, nuts, chicken, fish and fruits high in vitamin C,” says Pollock.